“Yeast sample for lab analysis”. That’s what was written on the label that was taped to the box that contained the beer that you see in the photo above these words. In addition to this beer, there were two other beers in the box from Monday Night Brewing: their Eye Patch Ale, which I have already reviewed, and their Drafty Kilt Scotch Ale. To be completely honest, prior to their email asking if we’d like to sample their beers, I had never heard of Monday Night Brewing. As is usually the case when I get an email from someone that I don’t know, I did a bit of interwebz research to see if the sender is legit. Thankfully, a simple “Monday Night Brewing” Google search led me to their website which then led me to their Twitter feed, Instagram account, and Facebook page. And if all that weren’t enough, I also found their brewery profile pages on Beer Advocate and Rate Beer. We spent almost 5 years perfecting our Eye Patch Ale and Drafty Kilt Scotch Ale before bringing them to market. Years of minor tweaks, arguments over hop profiles, and experiments with different brands of base malts are poured into every glass that we brew. In the summer of 2012 we launched our 3rd offering, Fu Manbrew, which won Bronze in the US Beer Open in its first month. A bright, spicy Belgian-style wit. An effervescent, easy-drinking wheat beer, brewed with Belgian yeast, German hops, and a whisper of ginger from the Far East. This mustachio’d Belgian-style wit believes that good beer defies borders. The name Fu Manbrew was crowdsourced with some help from our friends at Scoutmob. They call the mustache a “Flavor Savor” for a reason. Appearance: Pale orange color. Dare I say dusty copper? A very effervescent pour, though not much in the way of foam or lacing. Aroma: Subtle fruitiness with a hint of yeast. A bit of orange marmalade and some mild gingeriness (is that even a word?) showing up too. Taste: Light mouthfeel with medium, fizzy carbonation. Wheat and a bit of yeasty goodness at the onset. The ginger spice shows up at mid-palate and carries you through to the finish. A definite ginger beer-like tingle in the aftertaste. 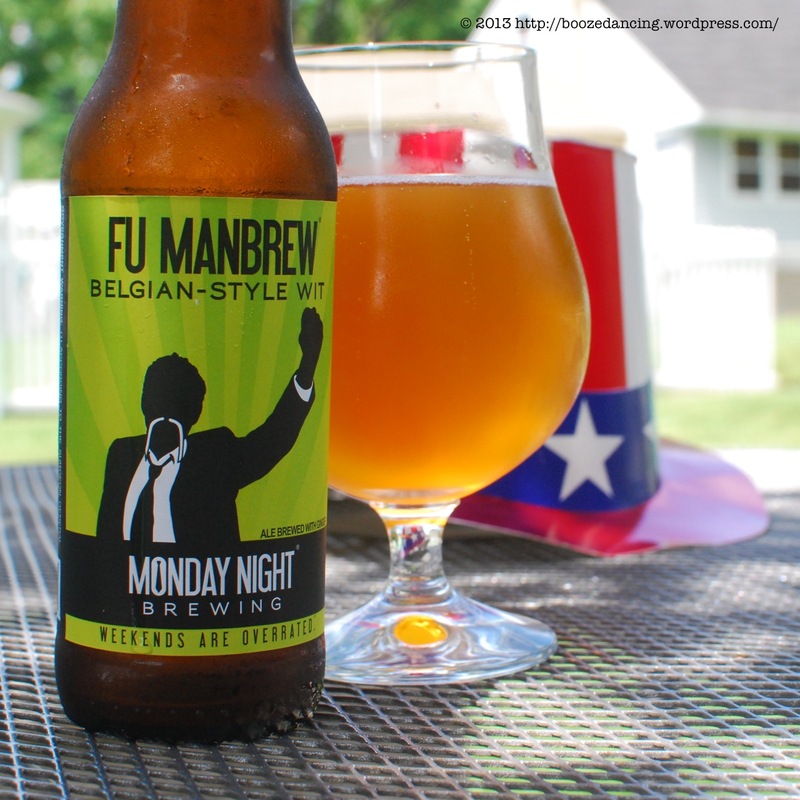 I really enjoyed my bottle of Monday Night Brewing’s Fu Manbrew. It’s crisp, refreshing, and even a little bit spicy thanks to the ginger that was added during the brewing process. I had this beer on a 90+ degree day (the 4th of July to be exact. Hence the red, white, and blue hat in the photo up above) and found it to be a perfect antidote for the hot and humid weather. Well done Monday Night Brewing! Many thanks to the good people at Monday Night Brewing for sending us this sample bottle! How DARE you say dusty copper?! Presumption comes easily to those who dine upon exoskeletal creatures at extraordinarily low cost for many a day. I’ll have to try it. Sounds like a nice brew and you have to give them props for reaching out to bloggers and the grass roots craft beer community for early input. I was really impressed with the SweetWater brews I found down in Tennessee. Atlanta may be another up and coming craft beer town and part of the Southeastern’s emergence as a legitimate craft beer region with Asheville as its capitol (a Southern capitol the entire Union can applaud and support). I gotta say, I quite enjoy this company’s names and logos. Pretty sweet. Glad the beer lives up to the awesome label. As I said in another reply, their beers aren’t mind blowing in any way, but they are well done and better than average. Pity they don’t distribute up here. Yet. Nice review but to be honest, I would have bought it for the packaging alone. Love the stache and the name, too. I’m with ya! I too am a sucker for some clever label art. Monday Night is within-state for us, so quite accessible. They make good stock beers- nothing totally unbelievably incredible, but very solid representations I think. Totally agree. This beer and the other two weren’t mind blowing in any way, but they were definitely solid, well made beers. And there’s absolutely nothing wrong with that.